Every year begins with a flood of questions to seo experts about their predictions or recommendations for the upcoming year. I am normally careful not to get involved into too many of these forays because they seem speculative or risky given Google’s penchant to change courses so quickly. When your target is moving so fast, so frequently, and seemingly erratically, it is hard to make predictions and recommendations. So, how should we proceed? I think that the link building guidelines can best be summarized with this simple aphorism: the only thing you can exchange for a link is the value that link offers the users. You can’t trade another link, or money, or widgets, or hosted content. 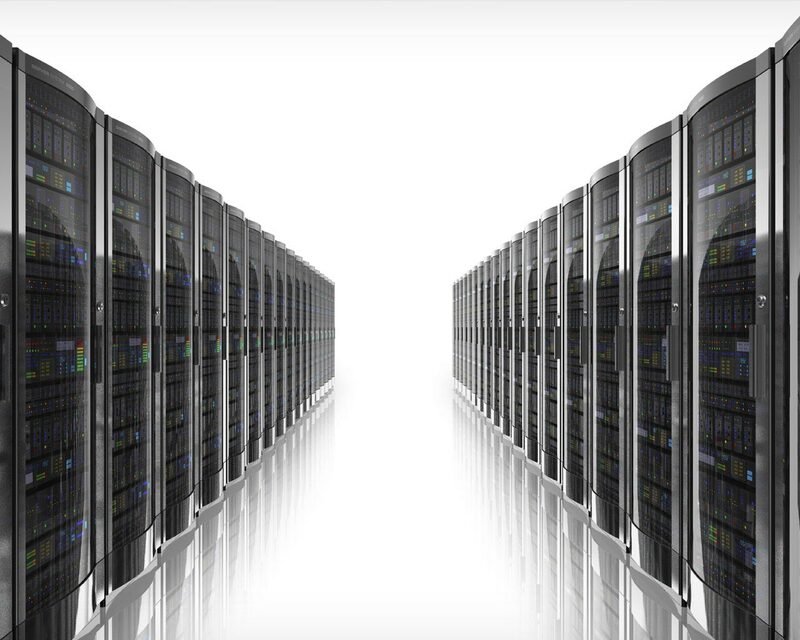 You can only offer the intrinsic value which your content offers that webmaster’s users. Broken link building is the epitome of this kind of content. The strategy is built around creating content that webmasters need and have linked to in the past and offers them nothing other than the quality of that content in exchange for a link. They link to you only if your content serves their users’ needs. 2. It gives you a plausible basis upon which to build industry relationships via outreach. Open Justification: Why should a person open the email you sent them in their inbox? Why in the world should they pay attention to your out-of-the-blue email? Broken link building solves this – they have a broken link on their site and you know where it is and how to fix it. Edit Justification: Why should a webmaster open their editor and edit the page? Why should this person link to your site? So what if you now “have a relationship”? Well, your relationship is predicated on the discovery of a problem on their site, and you have offered a solution, which happens to be a link to your site’s excellent replacement or related content! Simply put, there is no other outreach and content based strategy that solves both of these problems in a single email. There just isn’t. Unlike many other link building tactics, there isn’t much mystery behind broken link building. While there is certainly a great deal of misunderstanding on how to execute the campaign well, this is quickly remedied by reading one of the multiple excellent guides on how to do broken link building effectively. I have written extensively on the subject and would recommend both The Broken Link Building Bible and its update, the Broken Link Building Bible New Testament. Both explain in-depth how to run a start-to-finish effective broken link building campaign. This is perhaps the most important of the metrics. As I have said before, the effectiveness of a broken link building campaign is directly proportionate to the amount of good you do for the web. Your success is based on how much great content you create that matches the needs of webmasters who link to other great content that is no longer there. On top of that, there is an excellent tool available for assisting with the process so you can scale it. 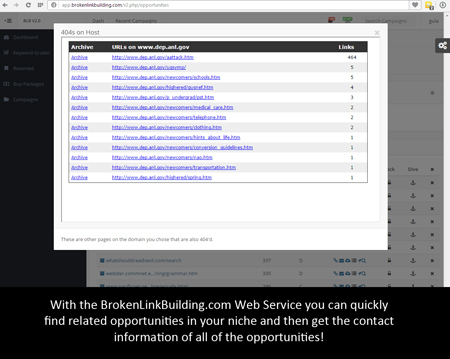 Garrett French’s BrokenLinkBuilding.com handles prospecting, qualification, and contact-finding all in one place. It does both of the major techniques: keyword based and URL based for prospecting. There are billions of broken links on the web all waiting to be fixed. The opportunities are being created every day when a webmaster changes URLs, deletes old content, drops domains, or updates their site incorrectly. 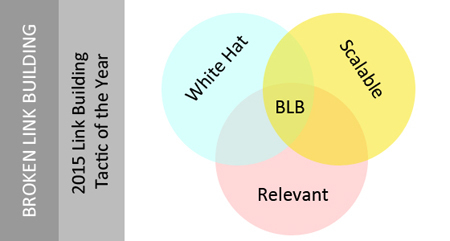 There aren’t many truly white hat link building tactics, and I am convinced that broken link building is the best of them. Thanks Russ. Still sharing great ideas after well over 10 years as an SEO. Good stuff Russ. This is the one link building technique that we barely explored when I was running an agency and it was always at the back of my mind as a missed opportunity. I’ve just never explored it much, but I’ve seen you, Garrett, etc. speak very favorably about it. Can you comment at all about efficiency? With something like guest posting I have a feel on what sort of response rates we’d expect. But what about broken link building. Higher rates? Lower? If you had someone do 40 hours combined of prospecting and outreach (assuming content is already done) how many reasonable links would you expect? I low it varies, but would love your guesstimate range based on experience since I have none with this tactic. Thanks in advance. Also by the way… Saw your “set it and forget it SEO” presentation in Charlotte years back and it’s still one of my favorite presentations in terms of both content and style! Just wanted to share kudos on this, albeit years late! Great reminder. We have done some broken link work, and you do need to stay focused and consistently implement your systems. Seems like a good opportunity that will consistent grow. In my limited experience I would say you need to have a fast process, as the response is pretty low. But that’s based on a few months or part time efforts. Great article! I really enjoyed looking into all the helpful resources you provided. I have not given too much attention to broken link building but now I will refocus my dedicated learning time and explore this exciting technique.